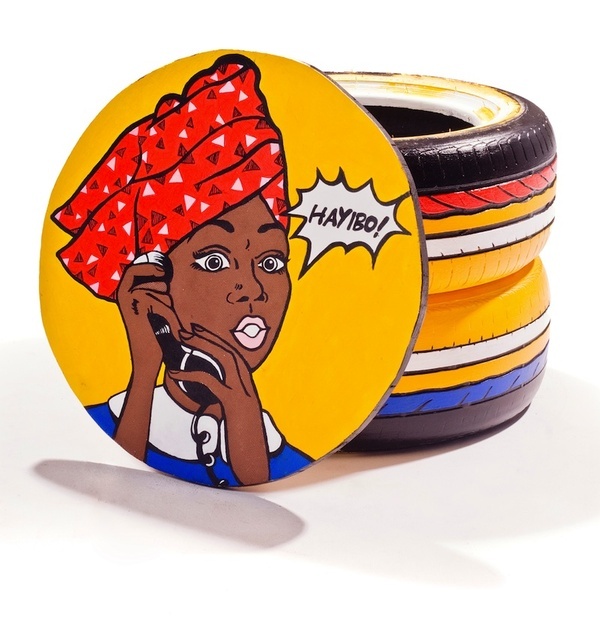 A combination of Roy Lichtenstein, South African slang and upcycled design. 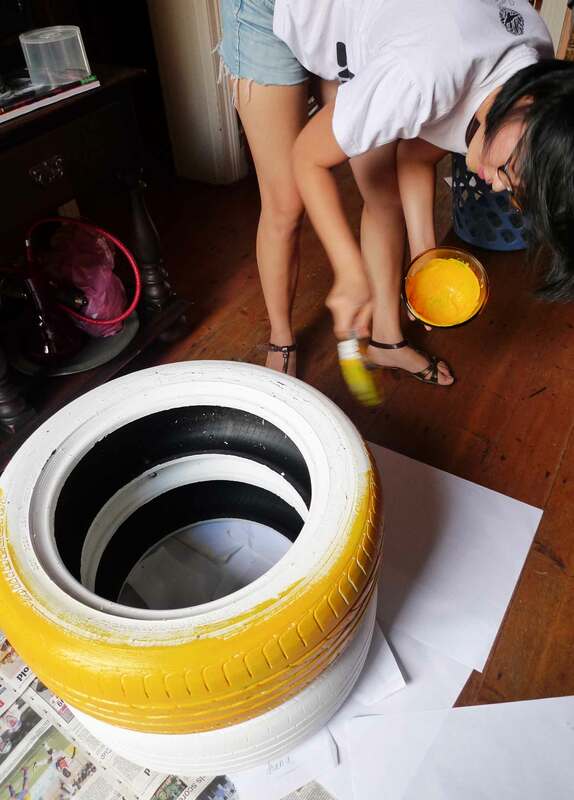 Yameng Li has reimagined a simple recycling idea into a work of art, by painting this unique tyre chair in collboration with Tyred, at the Design Indaba Conference 2010 in Cape Town. 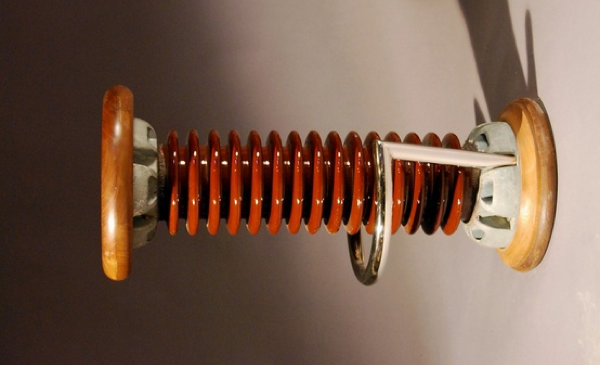 The high voltage insulator bar-stool available at LASSCO. For more infor on LASSCO see our earlier post. 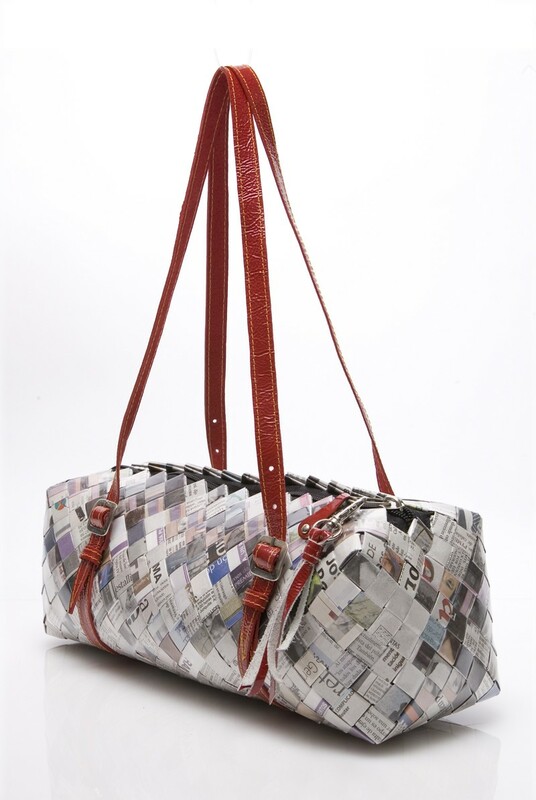 Nahui Ollin bags are made from recycled materials. 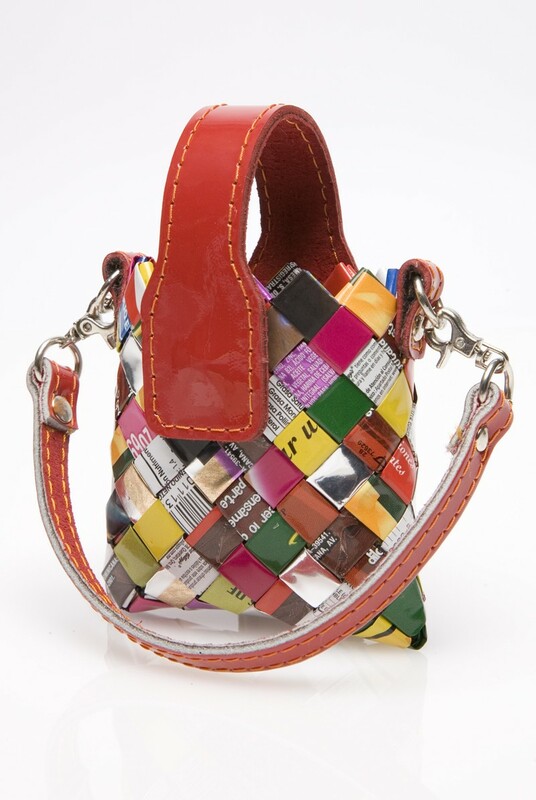 Every bag is unique and is constructed from old sweet wrappers, newpapers, barcodes, magazines or bottle labels. Nahui Ollin is inspired by ancient South American traditions and mythology. 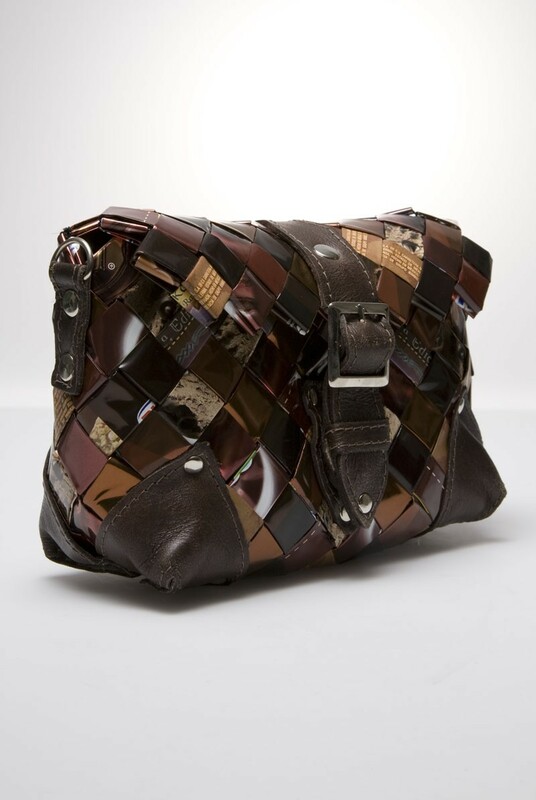 The bags are crafted using ancient Mayan weaving techniques. 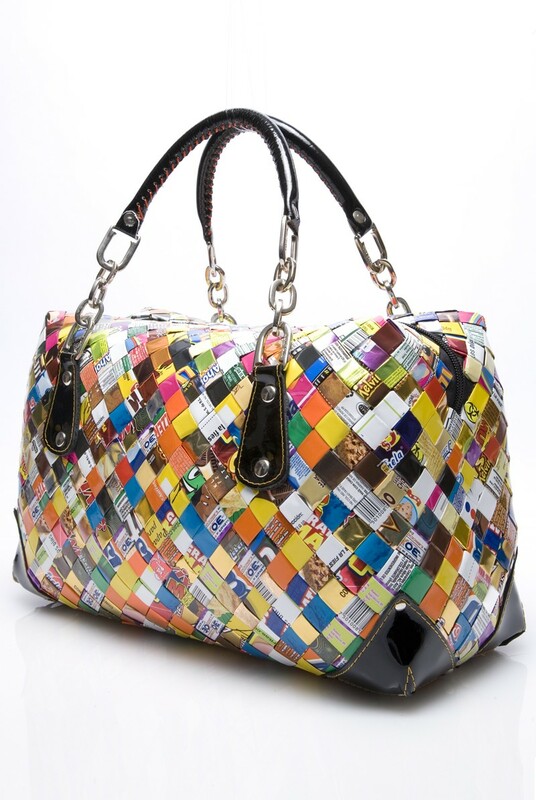 It can take up to four thousand sweet wrappers and as long as four days for an individual artisan to make one bag. 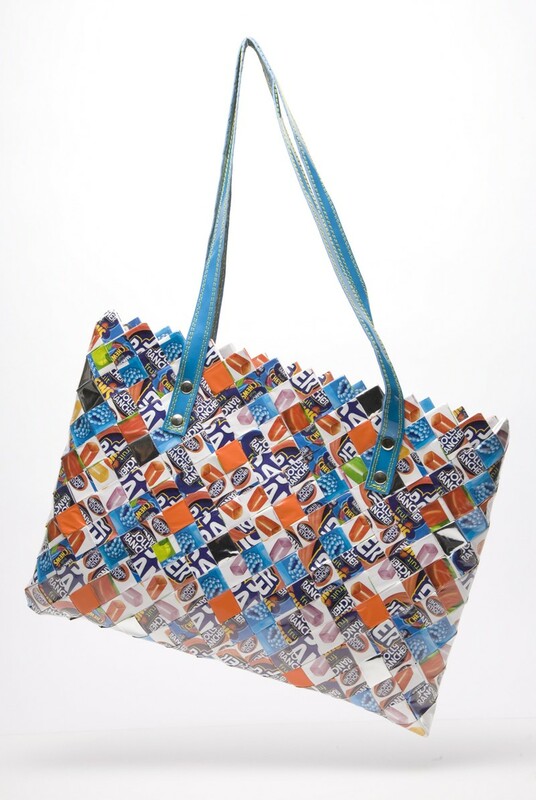 Their unique process ensures that no two bags are the same and despite being made from paper wrappers and labels, they do stand the test of time and weather for tear-free, long-term durability. 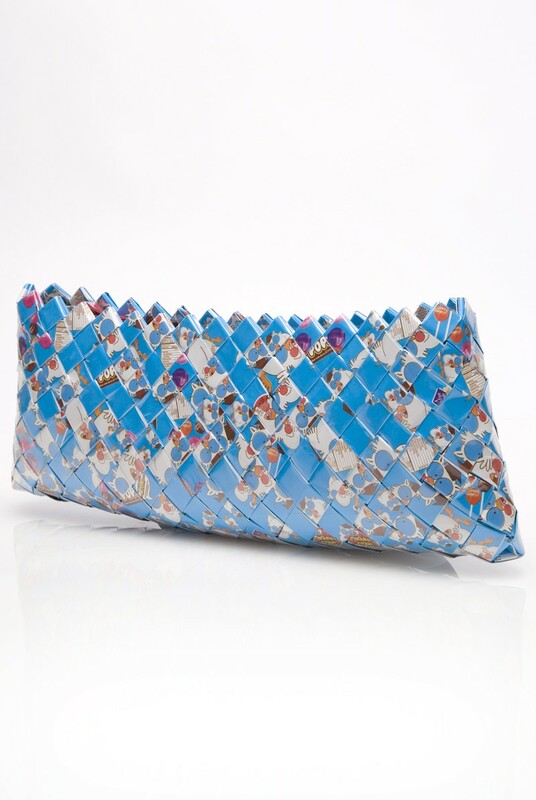 Each bag is hand-made from around 1500 individual wrappers and follows a process of folding, weaving and sewing each one into place – sometimes taking up to three days to make. 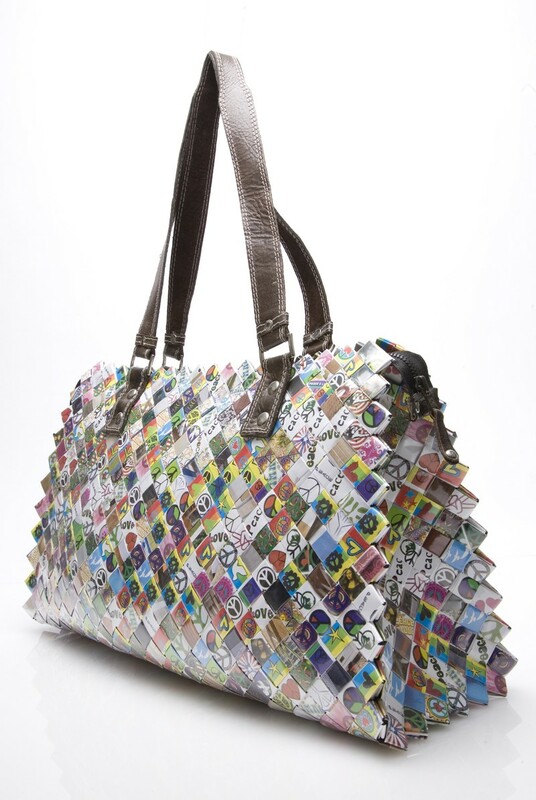 Being that the wrappers are put into place one at a time, each bag is produced in its own colour scheme and pattern, insuring that it is one-of-a-kind. Although you may expect most Nahui Ollin bags to be colourful and cute, aimed more at young teenage girls than grown women, you’d be surprised at how diverse the range of bags are. 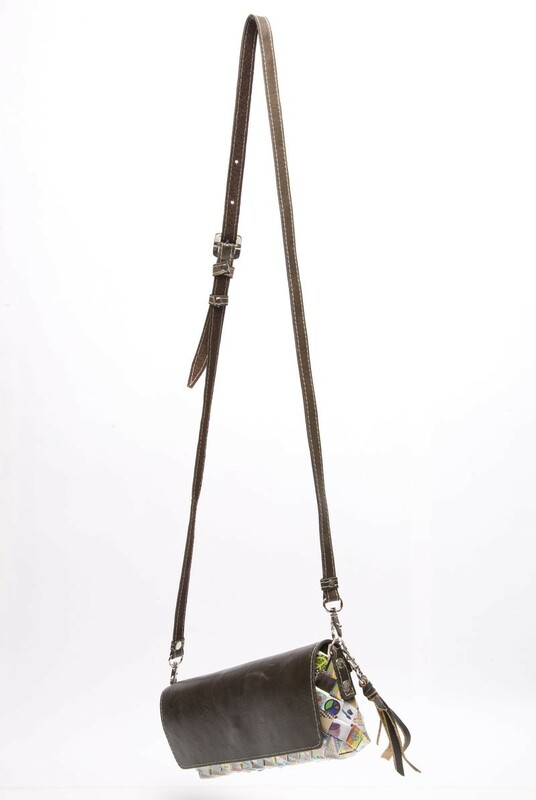 There is a huge variety in shape, size and style of these unique bags, whether you are looking for an evening bag, a bag for grocery shopping or a smart bag to wear to the office. 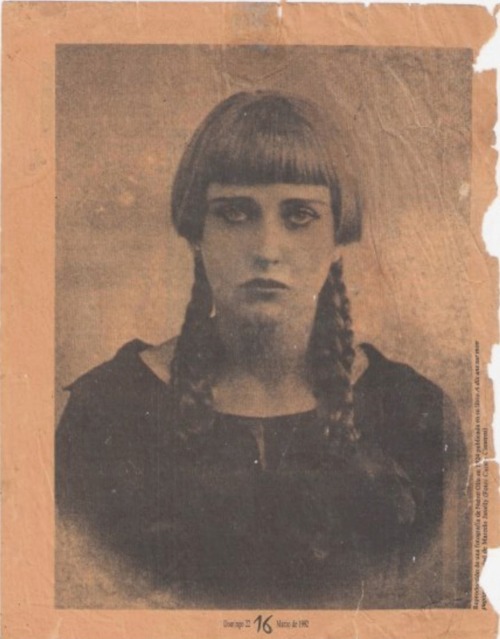 Nahui Ollin is also the name given to a famous Mexican artist’s model Carmen Mondragon by Gerald Murillo (also known as Dr Atl) with whom she had an intense love affair. He named her after the symbol of Aztec renewal meaning “four movement” – the fifth and last epoch and the sun of earthquakes which will result in the extinction of the human race. Carmen Mondragon also known as Nahui Ollin, this photo also shares a close resemblence to the Nahui Ollin logo. Nahui Ollin seek to remain ethical as well as sustainable in the production of their goods, ensuring they stick to Fair Trade and Sweatshop free practices in Mexico. Their growing family of upcycling partners such as Tootsie, Disney, Hershey’s, pez, and Target has allowed them to create a cottage industry helping to support local artisans. 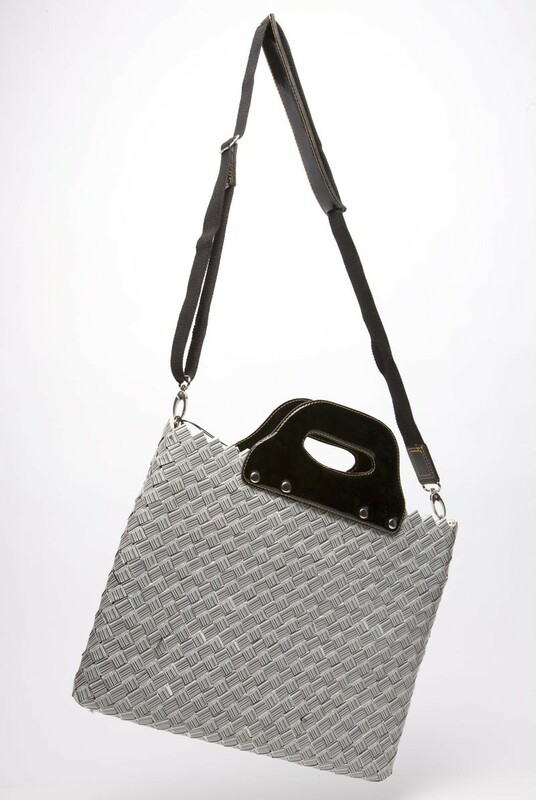 The bags are a stylish alternative to the handbags made by the big designers, they are ethical, sustainable and you will be sure to have the only one of it’s kind as each bag is individual. Since the London Design Festival started last Friday exhibitions are popping up all over the capitol. From over 300 hundred different events to choose from it can be difficult to know where to start. 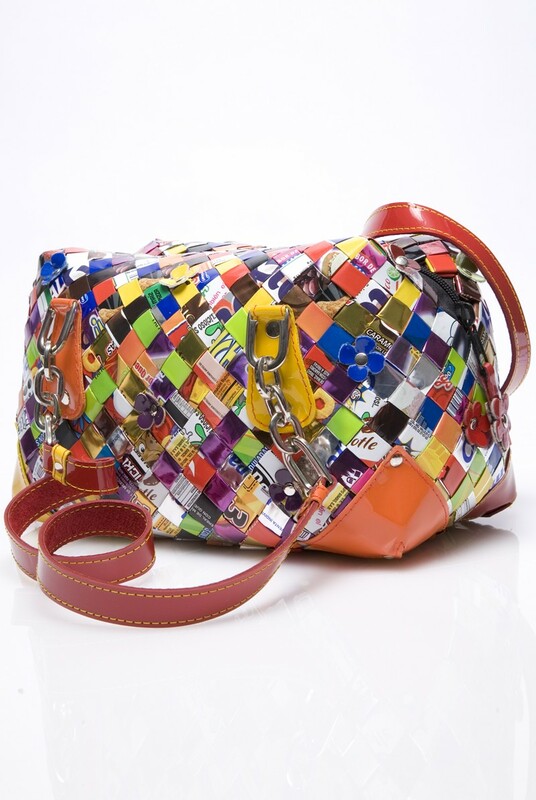 Here are the best picks for recycled related design events and exhibitions. The V&A, the hub of the LDF has several sustainable design exhibitions, including E-side and the Evolutionary Wall. From 14-23 September at the V&A. Tent London is regarded as the most cutting-edge and progressive trade exhibition during the London Design Festival. Housed in the Old Truman Brewery in Brick Lane, it has a huge range of independent and fascinating designers exhibiting their work. Tent runs from 20-23 September. 100% Design is the largest and most prestigious single-site design event in the UK, it hosts a huge range of brilliant design talent from all around the world. From the 19-22 September at Earls Court Exhibition Centre 2, Warwick Road, London, SW5 9TA. Decorex is a huge design show held at the Royal Hospital in Chelsea, this is for those with expensive taste, showing high end international interior design exhibits. From 23-26 September at Royal Hospital Road, London, Greater London SW3 4SR. At the DesignJunction the sustainable exhibition 2nd Cycle will feature Artek, a Finnish furniture company, which seek to highlight the issue of conscious consuming and authentic design through an upcycling project. Their philosophy promotes traditional craftsmanship with modern interventions. “Nothing old is ever reborn but neither does it totally disappear. And that which has once been born, will always reappear in a new form.” –Alvar Aalto, one of the founders of Artek. A sale of second-hand vintage furniture run by Fernandez & Wells, will be available to buy at twentytwentyone. From 19 – 23 September at The Old Sorting Office New Oxford Street. Designersblock at the Southbank Centre has a selection of sustainable furniture and lighting, featuring UTREM LUX, Polliander, Joe Gibbs and numerous other great designers. From the 20-23 September at the Southbank Centre. Blake Avenue in LA has a wide selection of tables, shelves and cabinets made from reclaimed wood. The products are simple, elegant and beautifully crafted. Most of the materials that go into Blake Avenue furniture is recovered from architecture that dates back 80 to 150 years and are hand picked and reworked to a high standard. Blake Avenue seek to preserve precious materials with design and craftsmanship that will allow their pieces to last another lifetime. Every piece has its own unique characteristics carrying their own stories showing the the complex and lengthy lifecycle these timbers, carrying with them a history of use and production that will never be repeated. Blake Avenue gives these old and sturdy materials a new lease of life by incorporating them into contemporary designs and restoring them to a quality that is built to last. Emeco SEZZ Counter Stool made from 80% recycled aluminium. The easychair is designed to fold up and effectively transform into a different chair, reversing the seat and adjusting the height. The easychair was designed by Amsterdam based designer Jair Straschnow as part of the Grasswork series. The range evolved from a series of experiments in self-assembly furniture and is designed to be simple, space-saving and sustainable. 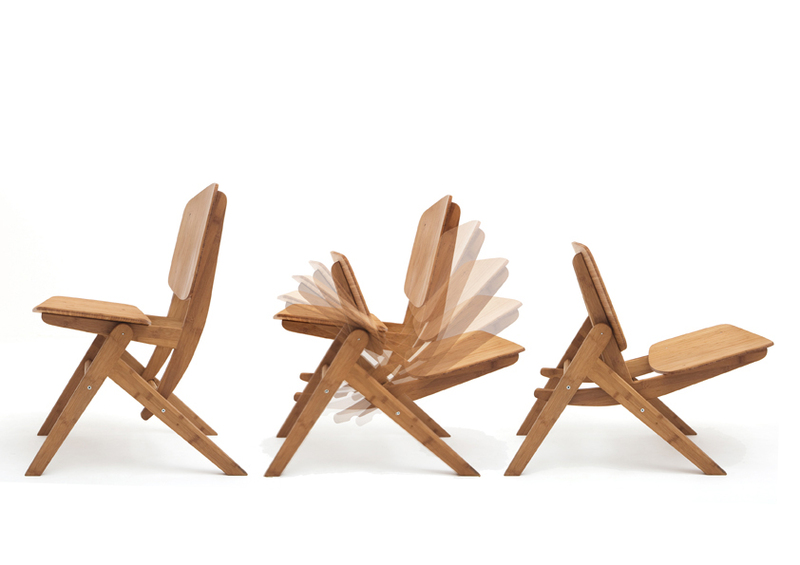 The chairs are made from bamboo laminate sheets, a sustainable source. Bamboo is the fastest growing plant on earth and can be harvested again and again from the same stalk.